Waves of deep sapphire revolve around an intense indigo center of Art Glass in this award with a black cast stone base. These Scroll Plaques are something truly unique and different. The plaques are shaped to look like a piece of parchment that has roll on the top and bottom while the rich rosewood finish completes these awards. Flexibility is the key to these awards as they are available in 3 different sizes, 7" X 9", 8" X 10", or 9" X 12". They are laserable and all provide ample room for whatever you personalization needs might be. A simple piece of green marble is the foundation for a remarkable star shaped jade glass award. Bevels compliment the outline of the Sebring Clock in a captivating way. Select this timepiece to honor employee years of service or on-time delivery. The Nik Meller Collection of elegant premium grade optic crystal Awards are designed by International furniture designer and sculptor Nik Meller. The Crystal Seeq Award highlights a beautiful ellipse integrating three tones. The stepped base is carved in a radiant cobalt blue and clear crystal accenting the curves. Rising from the base is a sophisticated clear crystal ellipse with a cobalt blue crystal crest with white crystal accents. This majestic and poised award will be coveted by all who receive it. Available in two standard sizes. Custom sizes and multiple color combinations available upon request. 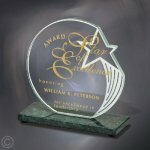 Gold tones shine through this elegant water edged clear acrylic award bring out the best in light reflection. Full color imprinting available as an optional imprinting method for this acrylic award.